I have been playing music since 1971 after getting my first guitar. Primarily a singer at the time, the addition of the guitar was supposed to make me a better singer. Instead Dad gave me the first tool of a career that has lasted since 1974. Taking guitar lessons from a retired studio guitarist who told me that I could be one hell of a guitarist if I practiced, I took his advice. I learned all he could offer and after two years was told that I could start teaching beginners. In the only true music store in the area where the professional musicians would meet, network, and teach I started my teaching career. After graduation from high school, I was given the opportunity to continue my education as a music teacher while I taught guitar with those old pros while in college. It also helped turn me into a professional guitarist in the area. As a result, I have played for organizations as U.S. Navy, Walt Disney World, Busch Gardens, Tampa, the Mantovani Orchestra, Delta Steamboat Company, and countless entertainers to include, Bob Hope, Dinah Shore, Cab Calloway, Andy Williams, Englebert Humperdink, Perry Como, and Former Presidents George H. W. Bush, Bill Clinton, and countless foreign diplomats and dignitaries. 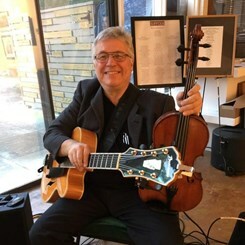 I have taught for the Portsmouth public schools, Hampton City Schools, Thomas Nelson Community College and currently Virginia Beach City Public Schools as an elementary strings teacher. I am looking forward to serving you in the coming weeks.